Film critics and audiences alike are never truly consistent in their affections for the science fiction genre. Sometimes movie goers value extravagant action scenes and easy to follow plot lines in their sci-fi movies, yet other times these types of movies fail at the box office. And deeper, slower films seem to fail just as often as they succeed. This month’s cinematic release of “Arrival” has certainly kept that pattern in tact. Resembling a 1960’s episode of Star Trek much more than it does the new action oriented saga that was first helmed by J.J. Abrams, “Arrival” is an extremely dramatic spin on the classic trope of a global alien encounter on Earth and mankind’s reaction to it. Starring Amy Adams and Jeremy Renner as the story’s protagonist and deuteragonist respectively, the film takes the concept of an extraterrestrial “invasion” and turns it on its metaphorical head. 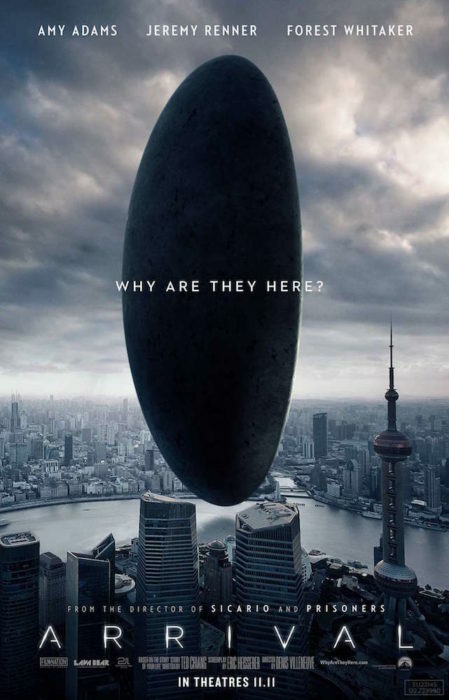 Instead of focusing on explosions and action set pieces, “Arrival” utilizes CGI to instead tell the story of Louise Banks (Adams) and how she plays a role in the very mysterious communications with the alien race. While the threat of warfare looms in the background, Banks and Ian Donnelly (Renner) work to figure out exactly what the aliens are doing on Earth. Taking cues from directors such as Christopher Nolan and Ridley Scott, Villeneuve gives his large-scale story a very personal and touching feel. Similar to the aforementioned Nolan’s 2014 blockbuster “Interstellar”, this film adds a family oriented subplot to very thematically inclined “bigger” story. But just like some of its predecessors, “Arrival” fails to impress a wide variety of sci-fi fans. On one hand, the film is a bit too simple in the sense that its final act spells out its main purpose in a not so subtle way. A film that is built around suspense should not conclude with information being spoon-fed to its viewers, but “Arrival” is guilty of overstepping its boundaries in that regard during one or two key scenes. On the other hand, “Arrival” is somehow simultaneously able to frustrate viewers in a completely opposite way. The convoluted nature of the plot takes a few too many liberties in order to achieve its admittedly pretty powerful ending, leaving the second and third acts of the film with a good deal of holes in science fiction logic. “Arrival” manages to almost hybridize two different sides of its genre even when its slow pace is taken into account. Despite its flaws, it is still a great work in science fiction.